8-inch action figure based on the TV series MIKE TYSON MYSTERIES™! Multiple points of articulation and fabric clothing all done in retro Mego style. Entertainment Earth Convention Exclusive! Whether it's on Earth or the vast reaches of space, there is only one man (and Pigeon) who can solve the mysteries of the Universe. 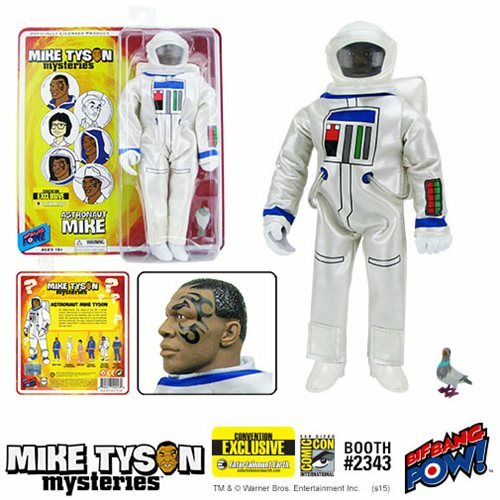 Now collectors can add the figure of the man to their collection with the Mike Tyson Mysteries Mike Tyson Astronaut 8-Inch Action Figure with Pigeon - Conevntion Exclusive thanks to Bif Bang Pow!. This 8-inch retro Mego style figure features the champ in a vintage all-fabric spacesuit and plastic astronaut helmet inspired by the outfit worn by Mike Tyson's alter-ego on Mike Tyson Mysteries. This figure sports the infamous facial tattoo and has multiple points of articulation. Also included with this 1,968 piece individually numbered limited edition convention exclusive is Mike's trusty associate, Pigeon! In the new animated comedy series MIKE TYSON MYSTERIES™, Mike Tyson is taking the fight from the boxing ring to the streets...by solving mysteries! Armed with a magical tattoo on his face and a trusty associate by his side—a talking pigeon—if you have a problem that needs solving, Mike is in your corner. MIKE TYSON MYSTERIES: TM & ©: Warner Bros. Entertainment Inc.